The amino acid L-tyrosine found in weight-loss products may help you in the area of cognitive abilities, the University of Maryland Medical Center reports. Physicians and researchers have used it to treat narcolepsy, depression and symptoms of chronic fatigue. This amino acid can be found in foods such as nuts, seeds, bananas, poultry, seafood and lima beans. Side effects have been reported with use of this supplemental amino acid, so speak to your doctor before taking L-tyrosine supplements. Unusual anxiety may happen as a side effect of this amino acid, the Nutritional Supplements Help Guide reports. While this amino acid influences cognitive abilities, it still acts as a stimulant to your central nervous system. The ingestion of L-tyrosine can increase impulses in your nerve center of your body. Increased feelings of fear and panic may occur with use of this product on a regular basis. Stomach irritation can occur when you start taking L-tyrosine as a supplement. Your digestive tract lining may become irritated and this can cause stomach discomfort. If you notice blood in your stools, report it to your doctor and stop taking this supplement product. You will need an evaluation for the bleeding from irritation if it occurs. Migraine headaches may occur as you continue to consume this amino acid, the University of Maryland Medical Center reports. 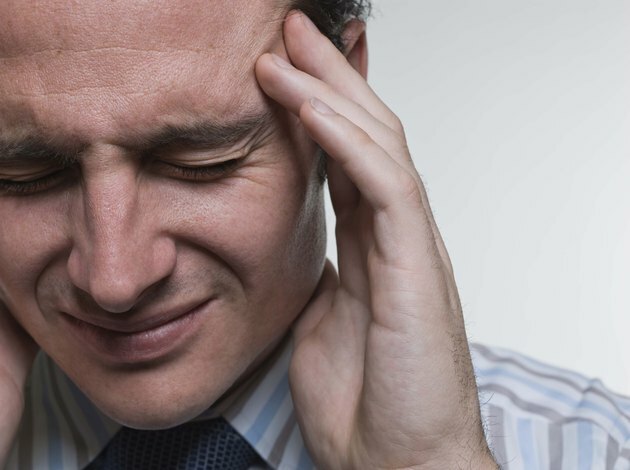 Migraines, a form of severe and lasting headaches, can occur even if you never have experienced them previously. Regular, over-the-counter pain medicine may not help. You will need to contact your physician if you experience this type of headache. Stop taking this amino acid product if you get migraines. Gastric upset such as reflux of stomach contents into your esophagus can happen as a result of ingesting L-tyrosine as a supplement, the University of Maryland Medical Center states. Your esophageal sphincter at the end of your esophagus can relax due to this amino acid. Because of this relaxation, your stomach contents can flow back up into your esophagus causing heartburn, indigestion and eventually damage. You need to stop taking this product if this occurs and call your physician for treatment. Palpitations in the chest may occur as you continue to consume this product, the Nutritional Supplements Help Guide reports. This amino acid stimulates your central nervous system and can cause your heart to accelerate or beat harder. Seek medical treatment if this side effect of L-tyrosine occurs. Nervousness, another side effect of L-tyrosine, may occur because of its stimulating effect on your nervous system, WomentoWomen.com reports. You may feel jittery and upset for no reason. If you notice an increase in your nervousness level, speak with your physician. You may need to stop taking this amino acid as a supplement.